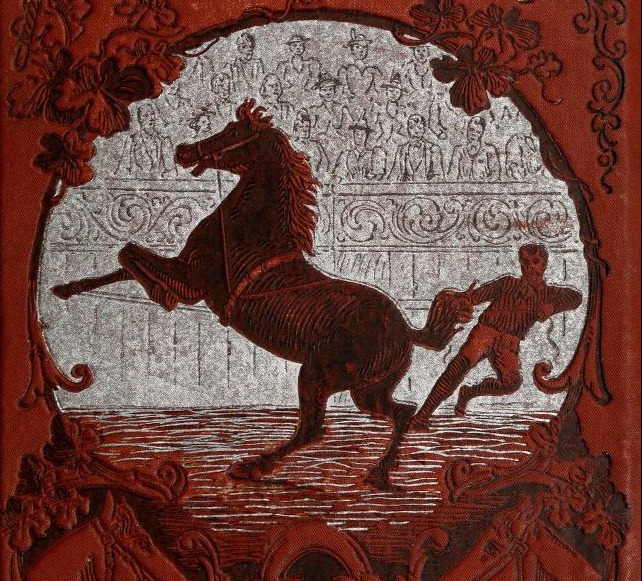 The Horses of Triflora have 4 legs. Some of the 2 legged Beings think they can just ride on the Horses’ Backs because of this. I can tell you this. The Horses are not amused. Things are much more polite over at Nerissa’s well. Nobody would even think of just jumping onto the back of a SeaHorse and going for a ride. When people come to visit, they bring their best manners with them. Mac McNeil from the Highlands wears his finest clothes when he comes to Nerissa’s. He polishes his wings. He brushes his hair. And he BOWS a lot. He does get nervous because some of the Mer People do not wear many clothes and up in the Highlands where he comes from, everyone wears plenty of clothes because its COLD. Mac McNeil is especially polite when he sees Pechera. Pechera has settled down a lot lately and doesn’t mind doing all the important work she has to do.But she still likes the ordinary life best of all. Mac McNeil has helped her a lot. Mac met Pechera when she was flying back from the Moon and he was flying about playing his bagpipes. Mac’s mother had told him that his playing sounded like a wolf howling at the moon. He thought that sounded rather wonderful so he took to flying about when the Moon was shining and playing his Pipes. The Highland Faeries are a wee bit unusual. Well. On the night I was talking about, Pechera heard the noise of his ‘music’ while she was flying back from the Moon, conked out and crashed right into Mac McNeil. It gave him rather a fright but he dropped his Pipes and managed to catch her before she tumbled to the ground. Mac gently flew her down to the ground and when she woke they had a rather interesting conversation about almost everything they could think of. It turned out that both of them had important work to do. But it also turned out that BOTH of them actually liked the ORDINARY LIFE best of all. They visit quite often now. And one thing they never ever do, is jump onto the back of a horse and expect to be taken wherever they want to go. The Horses have put this Poster up all around Triflora. 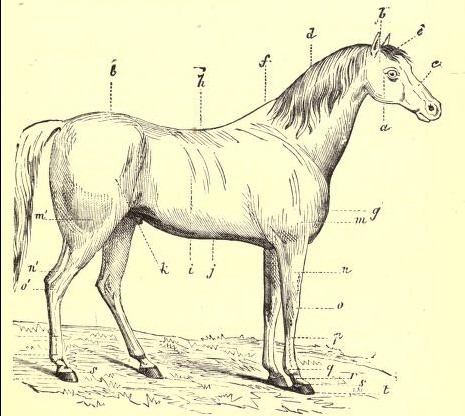 It shows all the Body Parts of a typical Triflorian Horse. The Horses hope it will make them seem more real to other Beings. A HORSE IS NOT A MACHINE. The hunt for the basket that was thrown off the bridge has been going on for 5 days now. The Keepers have been looking. Nana and her Friends have been looking. The Birds have been looking. The Sailors and the Pirates have been looking. All the Water People and Creatures have been looking but nothing had been found till this morning. Funny how things work out ! Not one of the Searchers found anything at all. Nerissa, who is Protector of the Water, could not think of one more thing to do. 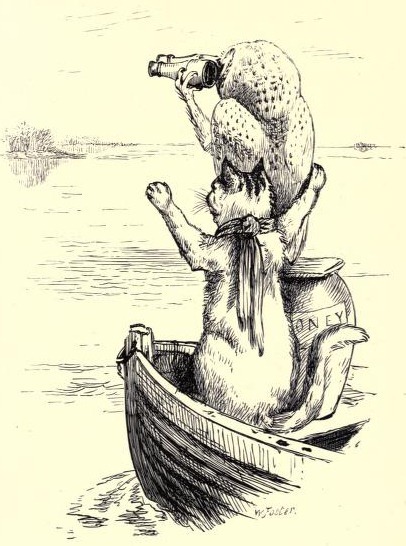 The Owl and the Pussycat have great plans for sailing off in their Pea Green Boat. They have been training for a very long time. Sometimes they simply row around in circles but today they actually set sail and were practically flying down the river when KABOOMPH ! The pea green boat hit a barrel floating in the water. It gave them quite a shock but it was more of a shock to see a little baby boy bounce off the top of it and into the river. They looked and looked through their binoculars. 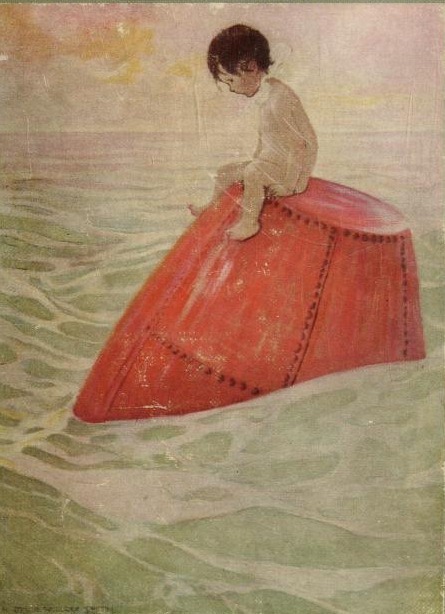 They could see a little island but they could not see a little boy. Nerissa could hear them but she wasn’t in any kind of a hurry. Nerissa doesn’t have many things wrong with her. She can live in land or underwater. 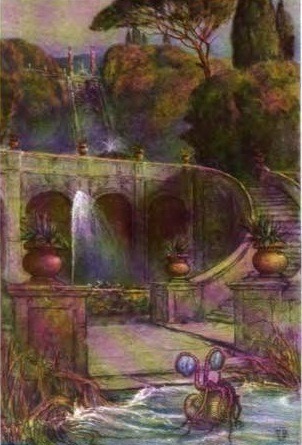 Her home is in the well at the edge of the River and she loves to sleep right down at the bottom under the water. She protects the water and everything in the water and on the water. The one thing that can be a bit of a problem with Nerissa is that she just plain forgets that most people don’t have gills. Gills are the things which let Merpeople and Fishes breathe under the water. She forgets that most people will DROWN if they stay underwater for more than 2 minutes because most people do not have gills. 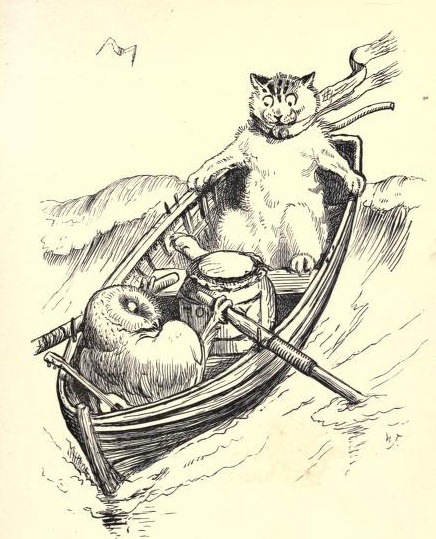 So, Nerissa was not in a hurry at all – but the Owl and the Pussycat were in ONE BIG HURRY. Owls and Pussycats do not have gills and they cannot breathe underwater. 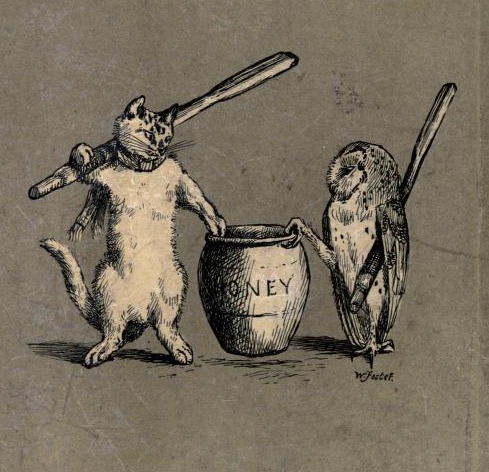 The Owl and the Pussycat knew that the Baby Boy was in Big Trouble. 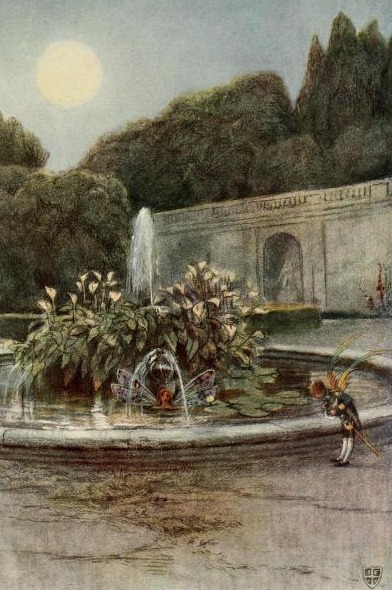 When Nerissa heard the Owl and the Pussycat coming up her steps and yelling out as loudly as they possibly could – she realised straight away that it was an EMERGENCY and dived down her well and was about to swim out into the river when an amazing thing happened. 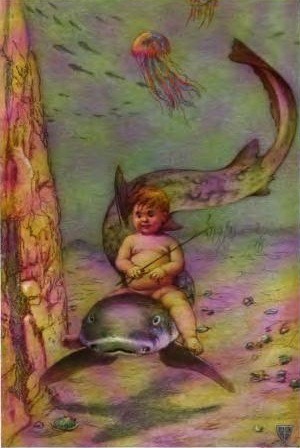 A Baby Boy with came riding in on the back of a shark. It was NOT a MerBaby. MerPeople have tails like fish. And he was not in any kind of danger at all. It was a Baby with legs. He was smiling at Nerissa laughing out loud. Nerissa was very excited. 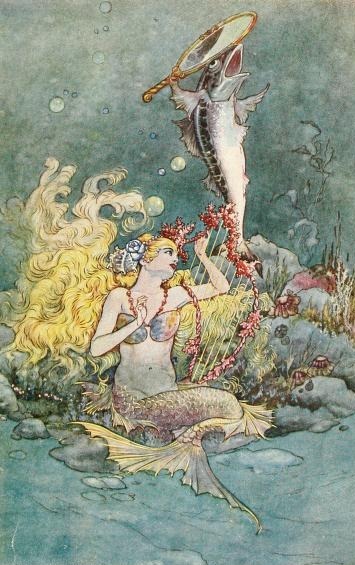 She had been NEVER met another SeaShellian in her whole life. Someone who could live on the land AND under the water. Now, here was this Baby Boy and it looked like he was going to stay. CLICK HERE TO SEE THE GILLS OF A SEASHELLIAN. Nerissa sent the Owl and the Pussycat back to Nana to tell everyone what had happened. Then she started to ask the little fellow a LOT of questions, but he just wrapped his arms around her and fell asleep. All the questions can wait until tomorrow.